Fancy an alternative to the gym to shed those extra festive season pounds? Some fresh air, beautiful views and an abundance of wildlife? 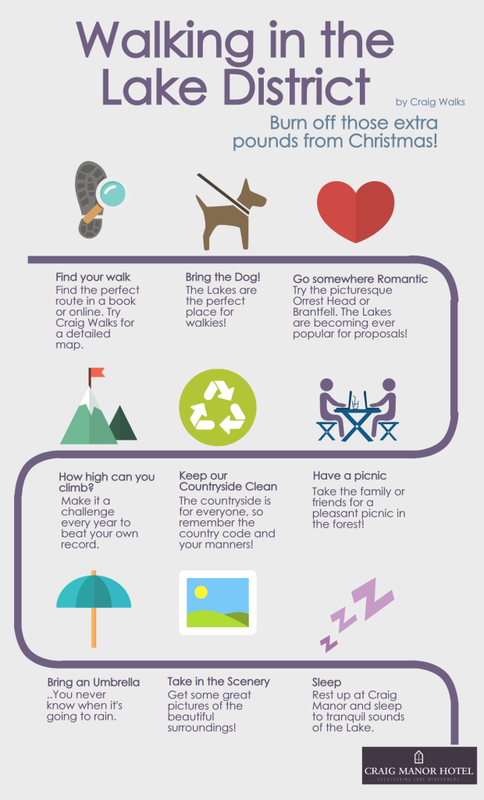 Why not get your boots on and take a walk in the Lakes? Whether that be a stroll around a lake with the dog, or a high ridge scramble with loved ones, there are Lake District walks to suit every occasion and every ability. If you are looking for a challenge, climbing Scafell Pike is the answer. Scafell Pike is the highest mountain in the Lake District National Park and in fact, England! Standing at 3,209 ft above sea level with endless routes to the top and on a clear day, views of Scotland, Wales, Ireland, and the Isle of Man. Alternatively, a more relaxing woodland stroll with a tasty picnic to boot may be more what you are looking for. Aira Force to Gowbarrow Fell is a lovely walk starting and finishing in divine woodland with memorable waterfalls along the way, in the middle is an open fell walk with wonderful views. For shorter walks closer to Craig Manor, such as Biskey Howe to Brantfell and Orrest Head, take a look at the routes described on Craig Manor Hotel’s website here. Whatever you decide to do in the Lakes in 2015, everyone at Craig Manor wishes you a very happy new year!